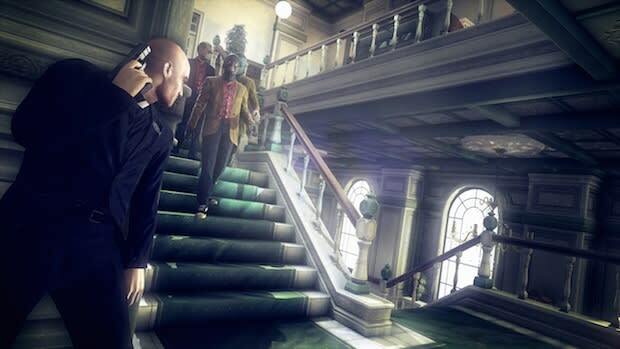 Stealth in Absolution excels when it comes to the tools available to Agent 47 whether it&apos;s through his own abilities or using the environment to his advantage. This has always been a major tenet of the franchise and Absolution looks to enhance it further. He can hide inside and peek through closets as well as crawl through vents with a lighter in hand. If 47 finds himself discretely snapping necks, the bodies can be dragged and hidden in freezers, garbage chutes and in the case of orphanages, a large playpen with those plastic balls. Certain rooms would be packed with thugs, which gave us cause for concern that a stealth playthrough could potentially be a frustrating exercise in trial and error. This was the kind of heavy foot traffic where it feels impractical to study NPC foot paths. But Agent 47 has gained a bit a special power since Hitman: Blood Money. Known as Instinct, this ability allows 47 to see enemy silhouettes through walls as well as predicted foot paths of enemies. Yes, these talents are a bit superhuman, but maybe we can chalk this up years and years worth of assassin experience. Of course this becomes much less of an issue if he manages to don a disguise, usually by taking the clothes of someone he just killed.